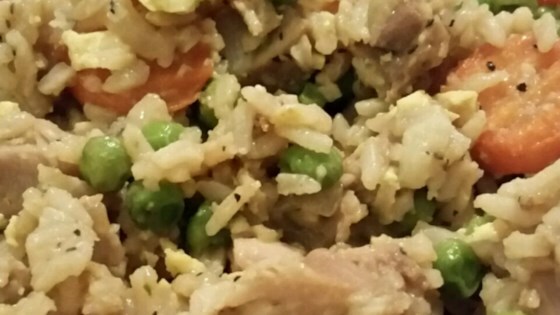 "Chicken, rice, soy sauce and shredded egg stir fried together. This is a very simple recipe. It is easy, but tasty! Note: Never use rice that you have just cooked." A quick chicken stir-fry with loads of crisp, colorful vegetables. Make sure your rice is COLD before you stir fry!!!! Excellent, easy recipe. I rinse the rice in cold water, so I don't have to wait. I also decreased the pepper because it's got a little too much zip.